The Midnight Review: Did Big Government Misrepresent Job Loss Figures For 2008 And 2009? 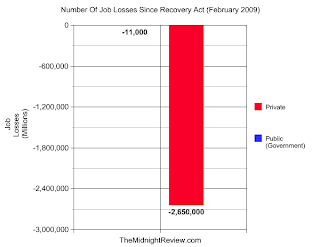 Did Big Government Misrepresent Job Loss Figures For 2008 And 2009? 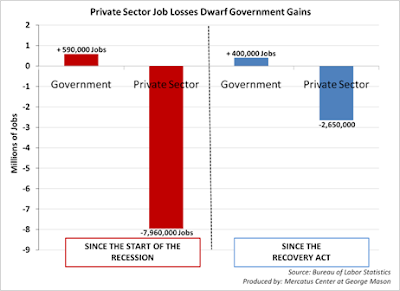 Veronique de Rugy posted the following graph on Big Government yesterday attempting to prove that the Obama administration is constantly expanding the government while the private sector continually shrinks. This graph is supposed to prove that since the beginning of the recession, which according to de Rugy started close to January of 2008, the government had gained 590,000 jobs, with an additional 400,000 of those jobs created since February 2009. 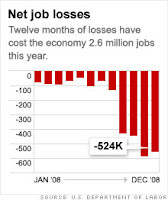 Keep in mind that President Obama was inaugurated January 20th, 2009, meaning the graph on the left represents gains and losses made during the Bush administration. I would now like to point to another Big Government article written by Gregg Opelka from June 5th in which Opelka indicates that the recent increase in jobs was inflated by the number of temporary census workers being hired by the government - the public sector. Friday’s May jobs figure is vastly skewed because of the hundreds of thousands of temporary census employees—approximately 411,000—hired to perform the decennial enumeration of the U.S. population and gather concomitant vital information. In the coming days, economists will be assessing the distorting effect the addition of these temporary public sector workers has on the restoration or creation of employment and the overall strength or weakness of the economic recovery. Now if my math is correct, when all those temporary government workers finish collecting their census data, the government will see a net loss of 11,000 jobs, which would indicate that since the Recovery Act, the size of government would have actually shrunk. I would like to point out that de Rugy's graph is confusing, unethical, and quite possibly wrong. First, de Rugy makes it unclear as to whether or not the losses since 2009 include the losses since 2008. If it is inclusive, that would show that the administration had actually eliminated an additional 190,000 public sector jobs. Secondly, consider the title of the graph: "Private Sector Job Losses Dwarf Government Gains." By the name alone, you can tell that de Rugy has an agenda, which would be to prove that the Obama administration has had a negative effect on the economy, and considering that she conveniently leaves out the fact that 411,000 of those government jobs are temporary, she purposefully misrepresented data to further that agenda. Thirdly, I question as to how de Rugy came to the number of losses since the beginning of the recession. 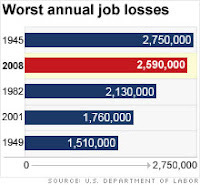 According to de Rugy, almost 8 million jobs were lost in the private sector alone, but according to this article written January of 2009 for CNN, total job loss for 2008 equaled 2.6 million - a fraction of what de Rugy states. In case CNN isn't good enough (I know some refer to it as the Communist News Network, here is another article from the BBC, in which the same number of losses, 2.6 million, is mentioned. Interestingly enough, the BBC article does reference the increase in full-time jobs that have been scaled back to part-time. Did de Rugy include these part-time positions in her job loss numbers? Did de Rugy include those already unemployed at the onset of the recession? I had written about de Rugy's unethical use of statistics in the past, when she compared the compensation of public and private sector employees, writing that government workers' pay rose 8% at a rate of 1.92% to the private sector's 1.78%. As I had pointed out back in May, when playing around with such small numbers, an unethical statistician can make mountains out of molehills, like de Rugy had done, giving the appearance that a difference of 0.14% is a greater disparity then what it really is. There are lies, damn lies, and statistics, but GOP lies are the biggest of all.